Padre Pio is the next big must-have, and here at last is a Pio gadget with moving parts. Shipmate Letitia Landers King, from Birmingham, Alabama, has plugged us into the Padre Pio electric statue (available from EWTN), which bows on command. 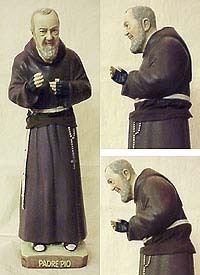 Handpainted and made of resin, the stooping saint originates in Italy and costs just $128.00. An electronic Pope John Paul II, kissing the airport tarmac, cannot be far behind.